Like this tutorial? 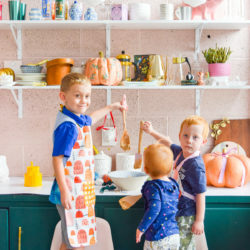 Click the link to subscribe to our YouTube channel for lots more DIY tutorials and project ideas! 1. 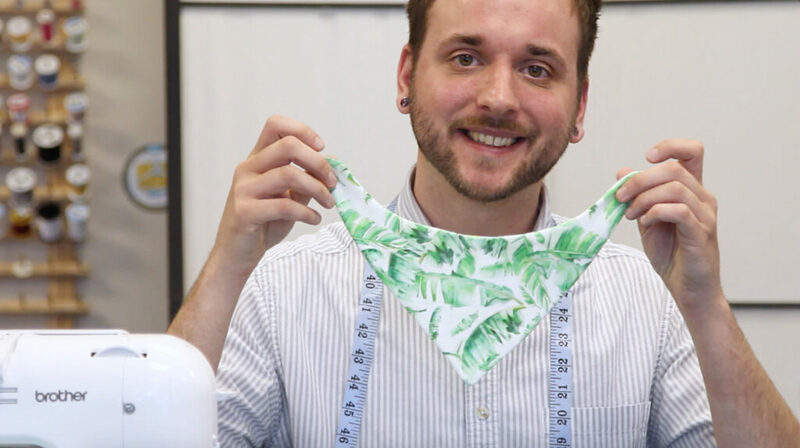 Cut out your pieces – You need to cut out two identical pieces with the bandana bib pattern, so fold your fabric in half, place the pattern right on the fold, and cut. You should end up with two boomerang shaped pieces. 3. Lay out your front and back pieces, right sides together. Pin everything in place. 4. 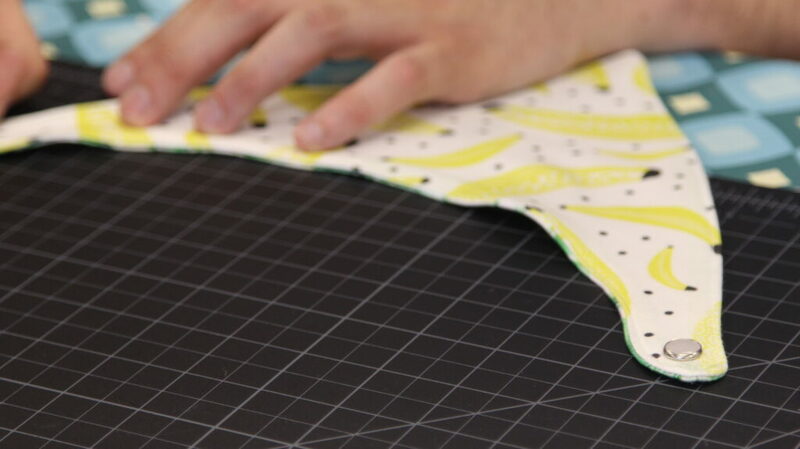 Sew around the edge with a ¼” seam allowance. Leave a gap (2” works great) for turning the bib inside out. 5. Now, flip the bib right side out. We like using a pencil to push out the corners. You should end up with something that looks like this. 6. Fold the edges of the gap inward, so they match the rest of the bib, and pin in place. 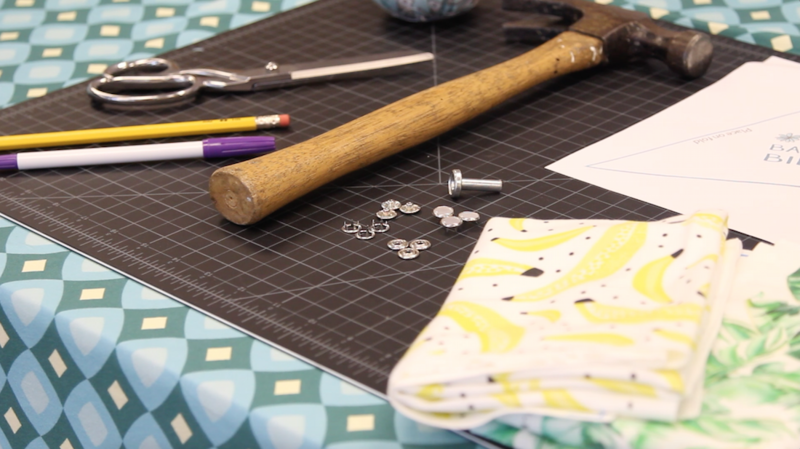 We’re going to topstitch around the bandana bib to give it a polished look, which will also close up the gap. 7. Next, add in your closure. We’re using pearl snaps, but you can use KAMsnaps, Velcro, or even a button. 8. That’s it! Now find a cute baby to put this thing on! 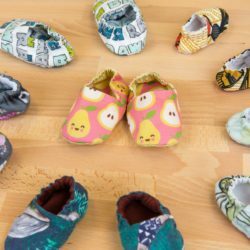 Looking for other newborn / baby craft projects? Check out knit baby leggings, this stretchy baby Jersey hat, an adorable baby kimono, or this baby tank top. 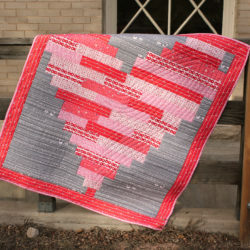 In addition to being real, real cute, these projects all use just a fat quarter of fabric, so they’re great for busting your stash and making good use of extra fabric. Happy making! Banana bib pattern will not print! Any suggestions? Hi Elizabeth, sorry you’re having trouble printing this PDF pattern! It’s working just fine for us, could the issue be with your printer or with your Adobe reader? The problem printing the PDF might be because the size of the pattern on the downloadable file is different from the size of the paper fed in the printer. You have to click the printing menu the option to fit it on a A4. I had the same issue and this solved it on my printer. Oh This is most wonderful – thank you for sharing – the PDf download and printed easily for me. Can’t wait to try it. Might I ask what other types of fabrics would be good for baby bibs? (I only have furry children) so I wouldn’t know first hand… thanks! 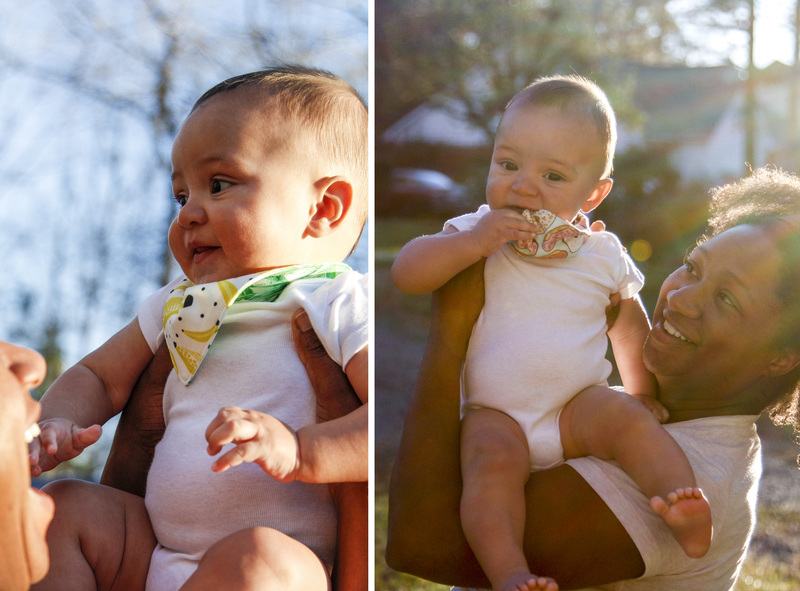 Our Organic Cotton Knit and Minky are great options for bibs! For something extra durable you could you Eco Canvas. We’ve made some bandanas for our fur babies using Organic Cotton Sateen and Kona Cotton. Love these but in my experience babies chew on their bibs. A. Lot! I cringe at the idea of snaps being used. Please I beg you to use Velcro! These are so cute! What age rage would you say these bibs would fit? We’re happy to hear you were able to see this pattern ranges from newborn to 3T! There are three patterns which range from 0 months – 3t. 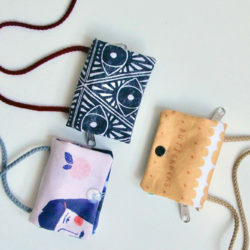 All sizes require just a fat quarter so they’re under 27″ x 18″. We hope that helps! Thanks for your question! 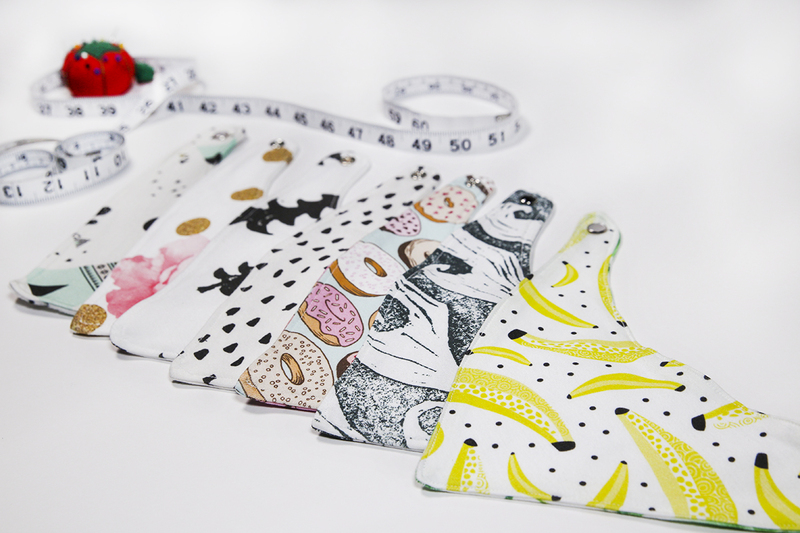 We’d love for you to make bibs with our free pattern. We’d recommend doing a sample of the 2T-3T and then size up or down accordingly. In regards to the PDF pattern file, I noticed that it doesn’t have one of the 2×2 test squares to make sure you are printing the pattern in the right size… Is it missing because even if you print it a tad smaller or larger it still turns out usable?